On a recent trip to Mexico I found this modern obsidian mirror in a craft market in Mexico City. Obsidian mirrors were made and prized by the Aztecs (Mexica) for their supposed healing and divination properties. They are still made today, mainly for the tourist market. I visited an obsidian workshop near Teotihuacan and saw how the black volcanic glass is cut and polished. Obsidian is commonly black but it can also occur with red or green hues depending on its mineral content, and it fractures much like flint, meaning it can be knapped into tools and ornaments – it was commonly used in this way by many Mesoamerican cultures. 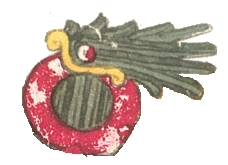 In Aztec times obsidian mirrors, much the same shape as this one, were associated with the God Tezcatlipoca, who had many associations – notably with the night sky and with sorcery. His name can be translated as “Smoking Mirror.” Contemporary Spanish chroniclers have described how such mirrors were used by the Aztecs in rituals to communicate with the underworld and also to foretell future events. 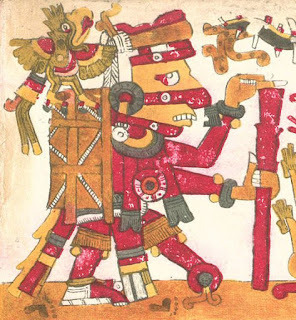 It was said that the last Aztec ruler, Moctezuma II (c.1466-1520), predicted the coming of the Spanish Conquistadors and the destruction of his empire from an omen which he witnessed in a mirror. Many of these magical obsidian mirrors were sent or brought back to Europe during the 16th Century and became highly prized artefacts amongst the learned aristocracy. Perhaps the most notable of these is the Aztec mirror which made its way into the possession of the English Elizabethan Magus, Dr John Dee (1527-1609), now in the British Museum. 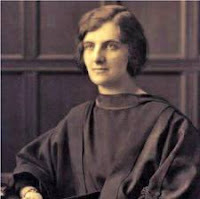 Dr Dee is perhaps most commonly remembered for his mystical dabblings in alchemy, sacred geometry, and, in particular, for his efforts to communicate with angels. He is also thought to have been the possible inspiration for the character of Prospero in William Shakespeare’s The Tempest. Dee used his obsidian mirror, along with other occult implements which he described as his “scrying stones” to perform séances which he believed would help him to achieve a deeper and more enlightened understanding of the manifold and mysterious workings of the universe. 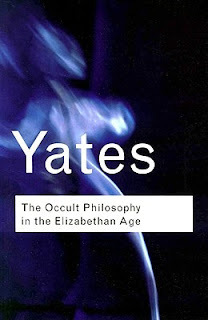 Scrying, as perceived by Dee, was in this sense an ‘optical science’ – which, if conducted piously and devoutly, was a sacred act not to be confused with the dark arts of the common conjuror or a ‘caller of devils.’ Indeed, the historian Frances Yates (1899-1981) has described Dee as a ‘Christian Cabbalist.’ A learned and scholarly man devoutly seeking to understand the truth of God’s manifest will codified and hidden in the wonders of creation. 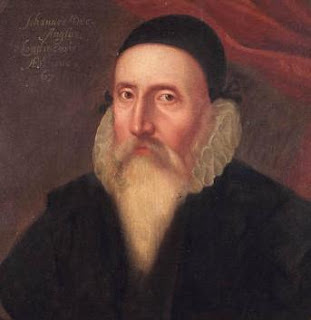 To this end he mixed the fundamental tenets of astronomy, astrology, alchemy, magic, mathematics, mechanics, and other methods of scientific mysticism or critical enquiry to achieve a higher knowledge, yet it was a dangerous vocation, and so Dee – although a familiar and close confidante of Queen Elizabeth I herself – prudently sought to veil his potentially blasphemous and heretical activities in secrecy. Dr Dee is a truly fascinating figure who has variously been painted as a deluded or duped, superstitious old wizard, as well as an accomplished mathematician and an enlightened philosopher, a genuine ‘Renaissance man’ or proto-scientist. 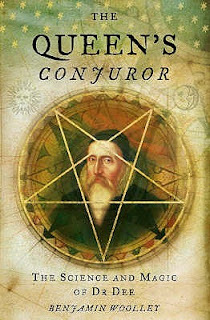 Benjamin Woolley’sThe Queen’s Conjuror: The Life and Magic of Dr Dee (2001) provides an interesting analysis of Dee’s life and work, which I highly recommend; along with the many scholarly works of Frances Yates, but in particular her highly respected overview of The Occult Philosophy in the Elizabethan Age (1979). I’ve yet to see any angels, devils, or portents of future fortune or ills in my own obsidian mirror. Although its highly polished surface, jet black but speckled with white flecks and faintly discernable seams, is highly reflective; as you can judge by the following photographs which show the reflection of my Shandley Williams’ Totem carving placed alongside the mirror (the modern North-West meets modern Central Mesoamerica!). The mirror, which is polished on both faces and along its edge, is approximately circular with a diameter measuring between 13 and 13.2cms, and is roughly 1.1cms thick. Looking at the strange illusion of depth offered by its dark polished surface it’s not difficult to see how the Aztecs and Dr Dee could have perceived such an unusual natural material as obsidian possessing mysterious and magical properties, offering a view into another realm of time or space. Simply seeing your own reflection in the same polished surface which you know Dr Dee and countless Aztec priests saw their own reflections is a magical sensation in and of itself. For any historian engaged in contemplating the past through the study of artefacts such as Dr Dee’s mirror - there is, it can safely be admitted, a certain affinity to be felt with our ancient forbears in this particular accord. You can see Dr Dee’s “scrying stones” and other magical implements (as well as your own reflection in Dr Dee’s obsidian mirror) in the Enlightenment Gallery (Room 1) at The British Museum.